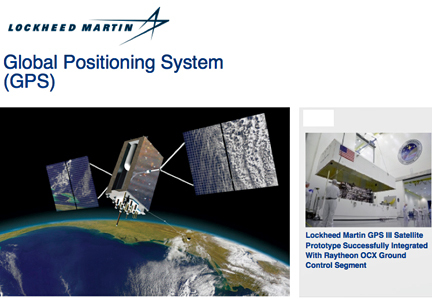 [SatNews] The U.S. Air Force has awarded Lockheed Martin [NYSE: LMT] more than $245 million in contract options to complete production of its seventh and eighth next-generation Global Positioning System satellites, known as GPS III. GPS III space vehicles seven and eight (SV 07-08) received initial funding under a February 2013 long lead material contract for the Air Force’s second set of four satellites, GPS III SV 05-08. Similar to this current award, the Air Force exercised an option to complete production of SV 05-06 in December 2013. The first two contracted GPS III satellites are already progressing through sequential integration and test work stations specifically designed for efficient and affordable satellite production at Lockheed Martin’s GPS III Processing Facility in Littleton, Colorado. In December 2013, Lockheed Martin powered on the SV-02 satellite bus and network communications equipment payload for the first time. The successful power-on test demonstrated the satellite’s mechanical integration, validated interfaces, and leads the way for electrical and integrated hardware-software testing. SV-01, which powered on in February 2013, now is in integration and test flow leading up to final delivery to the Air Force. GPS III is an important program for the Air Force, affordably replacing aging GPS satellites in orbit, while improving capability to meet the evolving demands of military, commercial and civilian users. GPS III satellites will deliver three times better accuracy; provide up to eight times improved anti-jamming capabilities; and include enhancements which extend spacecraft life 25 percent further than the prior GPS block. It will be the first GPS satellite with a new L1C civil signal designed to make it interoperable with other international global navigation satellite systems. The GPS III team is led by the Global Positioning Systems Directorate at the U.S. Air Force Space and Missile Systems Center. Lockheed Martin is the GPS III prime contractor with teammates Exelis, General Dynamics, Infinity Systems Engineering, Honeywell, ATK and other subcontractors. Air Force Space Command’s 2nd Space Operations Squadron (2SOPS), based at Schriever Air Force Base, Colorado, manages and operates the GPS constellation for both civil and military users.